China REQUIRES all foreign investors to give up their technology to them for the "right" to build goods there. Obama-seized GM can deny it till the cows come home, but it's still a lie. Dismantling America, chunk by chunk, piece by piece. Anybody see the tyrant-in-chief's body language, facial expressions and hand gestures, not to mention his words, at his Ohio press conference today? He simply can't hide his hatred for America. General Motors agreed in Shanghai today to develop an electric vehicle platform with longtime Chinese partner SAIC. It effectively moves GM's future electric vehicle development to China. Unclear is whether this would also lead to assembly of future EVs for the U.S. market in China. The deal came as the Chinese government is pushing foreign automakers to give Chinese companies EV technology they lack, according to an Associated Press report. U.S. lawmakers have complained that China is "shaking down" GM to get Volt secrets. Electric vehicle development in the U.S. has been developed with extensive U.S. taxpayer funding. Details of the plan were not provided, and GM has denied it will involve handing over intellectual property underlying the Volt. GM Vice Chairman Steve Girsky, in a conference call from Shanghai, said that neither SAIC nor the Chinese government have demanded Volt technology. Any future EV would, of course, draw on GM's Volt experience and technology. Under the deal, SAIC and GM will equally share the cost of developing a new all-electric vehicle, Girsky said. GM plans to start exporting Michigan-made Volts to China by year's end, but isn't likely to sell many. The Chinese government is pushing electrics with a subsidy that amounts to about $19,000 per car -- but only if the car is made in China. No imports allowed. There also are tariffs on cars imported to China, which lawmakers argue are unfair and may violate world trade rules. 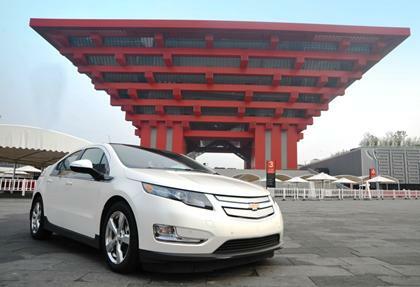 Girsky hinted that the Volt could eventually be built in China. "If we localize, eventually it won't have a tariff and it will get the subsidy. We have made no decision on if, when or where we build Volt in the future." The deal with Chinese government-owned SAIC was signed during a meeting of GM's board in Shanghai — a visit underscoring China's importance to GM. It was the board's first meeting outside the U.S.
GM spokesman Jay Cooney said the companies will work together to develop a next-generation, fully electric car. Shanghai is the site of GM's international headquarters and its successful venture with SAIC, which on Monday rolled out the 5 millionth vehicle since production began in late 1998. The push for more advanced technology reflects China's frustrations with its continued weakness in automotive technology, analysts say. After 25 years of auto joint ventures that require local partners to hold at least a 50% stake, domestic automakers still lag behind global rivals in automotive engineering. "China is not a technology leader in virtually any industry. The country has developed around low-cost production," said Bill Russo of consultancy Synergistics. "This is the irony, that the largest and biggest growth market has relatively weak domestic manufacturers." Although growth in the overall market has slowed in recent months, GM's sales in China still jumped 13.4% in August from a year earlier to a record 205,885 vehicles. A large share of the company's growth has come from sales of its mini vehicles in another venture, SAIC-GM-Wuling. But strong demand for foreign-brand sedans and sport-utility vehicles has also helped.